Before Emilie grew a full set of teeth we saw the beginnings of her enthusiasm for art. 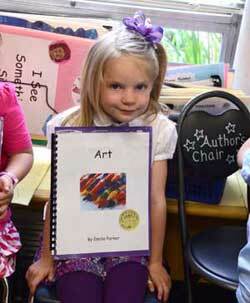 By the time she was 2 years old, she could write her own name and draw family stick portraits. Over time this enthusiasm grew into something of an addiction. 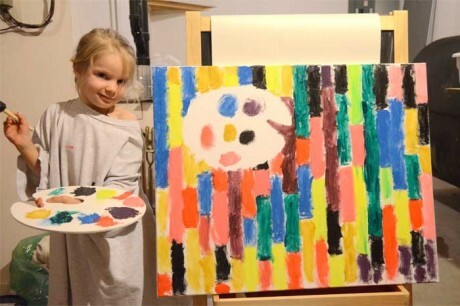 As parents we were often frustrated (and more times amazed) at constantly finding beads, bits of paper, colored cotton balls—or anything else Emilie thought she could use to create art—all over the house. She loved accompanying Alissa to the craft store to brainstorm her next project and also to fill her pockets with discarded materials she found on the ground. Eventually, we were forced to let go of our parenting instincts and allow our 3-year-old to use scissors. It was obvious to anyone who knew her that art was how she expressed herself and viewed the world. Emilie came to us one day with our family in Play-Doh. She was explaining each member of our family, and Alissa noticed a blob of Play-Doh on the belly of her figure. Alissa was immediately self-conscious of her weight until Emilie explained, “…and this is Mommy. and this [pointing to the blob] is her camera hanging on her neck.” Art was a way for her to not only express herself but also a way for us to understand the world through her eyes. How to Make a Bead Necklace from The Emilie Parker Fund. Learn More About Alissa’s New Book!